The extreme right-wing section of the Chauvinist Buddhist clergy, hand in gloves with the top echelons of the of the Political leadership of Mahinda Rajapakse’s government that killed lakhs of Tamil people in a Genocidal war is now unleashed against the Muslims in the Island Country. We need to condemn this in unequivocal terms through mass protests all around the world. The New Socialist Alternative (CWI-India) through its Tamil Solidarity campaign will be approaching other like minded groups and parties to come together for a massive protest in various parts of the country in the very near future. 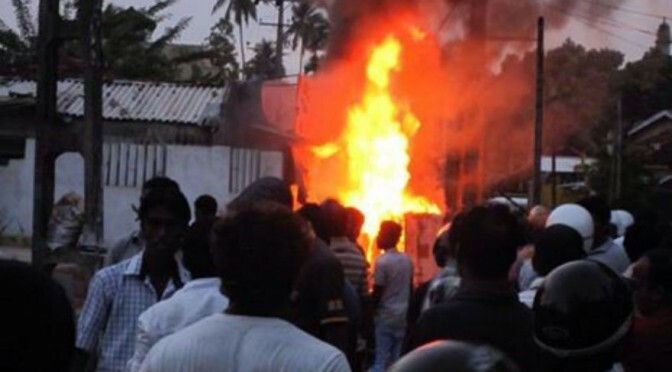 At least four people were killed and 100 injured as mobs ran riot in the southern coastal town of Aluthgama. Once again, they were led by the right-wing Buddhist nationalist group, Bodu Bala Sena (BBS) – with the backing, behind the scenes, of president Mahinda Rajapaksa’s brutal regime. He is using groups like BBS to whip up Sinhala nationalism, and as a means to divide and rule the island. The confrontation was sparked by a seemingly minor event: an argument over a traffic incident. Bodu Bala Sena used that to call a rally on 15 June. There, BBS leader, Galabodatte Tero, whipped up the mood of the crowd into one of searing anger: “If one Muslim lays a hand on a Sinhalese, that will be the end of all of them,” he threatened. He then used the poverty of the vast majority of the Sinhala people to further enrage the crowd, by saying that the Muslim small-businesspeople and shopkeepers have money, while they have nothing. Of course, the Rajapaksa regime encourages this kind of view. That is because, if people are fighting each other, they will not be blaming the regime for the extreme poverty affecting most people in Sri Lanka – Sinhala, Muslim and Tamil. 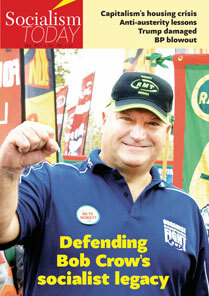 The only way to fight effectively against this generalised poverty is by uniting in common struggle for work on a living wage, for decent housing, education and health services, and for workers’ organisations (such as trade unions) which are genuinely independent of state control. Following the rally, with the crowd’s mood at boiling point, they were allowed to march into the predominantly Muslim areas, chanting anti-Muslim slogans. The mob set about attacking houses and anyone they could find on the streets. After a while, the regime sent in the Special Task Force and imposed curfews in Aluthgama and Berumala, using water cannon and tear gas to disperse the crowd. The Muslim Council of Sri Lanka has welcomed the curfew, but we have to issue a warning here: be careful what you wish for! In reality, the curfew has been directed against the Tamil Muslims. It actually stopped them from organising their own self-defence, and allowed the Buddhist monks and their followers to go from house to house attacking Muslim families and stealing from their houses. 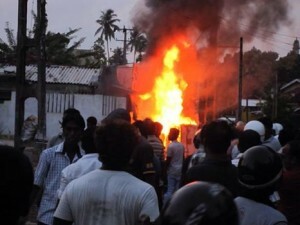 We do not have any faith in the regime’s security forces to defend communities in Sri Lanka. We will give every support to the people under attack. And we support action taken by communities, organised workers and other oppressed people, to organise their self-defence – and against the right-wing groups backed by the regime, such as Bodu Bala Sena. At the end of the day, a united response is the only way to defeat these divisive forces, and this brutal regime. Condemn `Foreign Funded’ Destructive Development Promoted by IB!Next PostChennai Building Collapse – Development or Destruction?